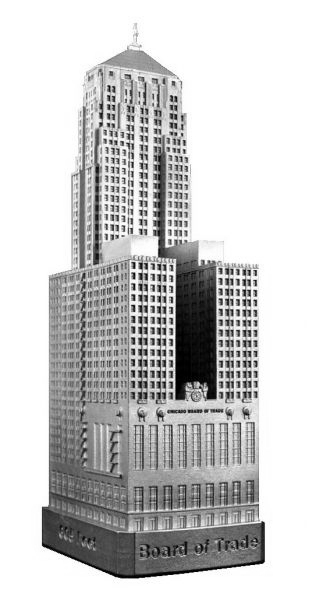 The Chicago Board of Trade is located at 141 W. Jackson Boulevard in Chicago, Illinois and was completed in 1930. This building was designed by Holabird & Root Architects and stands 605 feet tall with 44 floors. The Board of Trade holds the title world's tallest Art Deco Building outside of New York and was Chicago's tallest building for 35 years. This pewter replica stands 6 inches tall to the base of the Ceres statue and is finished in new pewter. Its SO Chicago! A lifelike snapshot of a deco queen wonderfully realized.